Walker was one of nineteen student performers in Paying Homage: Soil and Site, the show that concluded Artspace New Haven’s 2018 Summer Apprenticeship Program (SAP). Housed on Orange Street just south of the New Haven Green, Artspace focuses on providing a platform for contemporary artists to create art and connect with wider audiences. SAP, started in 2001, brings New Haven high school students under the instruction of a master artist each year. The man embracing Walker was ceramicist Roberto Lugo, this year’s artist-in-residence. For three weeks this summer, students from Greater New Haven worked with Lugo to honor their communities and the figures that have shaped them. At Lugo’s urging, for the first time, the program invited students from abroad to work alongside students from Connecticut: two teenage visitors from Riobamba, Ecuador. Lugo, who is of Puerto Rican descent and calls himself “the ghetto potter,” found ceramics inadvertently. Growing up in Kensington, a Philadelphia neighborhood, Lugo says his education was substandard. After graduating from high school, he was caught in a cycle of dead-end jobs. At 25, Lugo enrolled in ceramics classes at a community college, seeking change and companionship. Today, much of Lugo’s work is Victorian-inspired porcelain-ware, ranging from urns to tea sets. The artist pointed to porcelain as a symbol of class division; the material has historically been reserved for the elite. 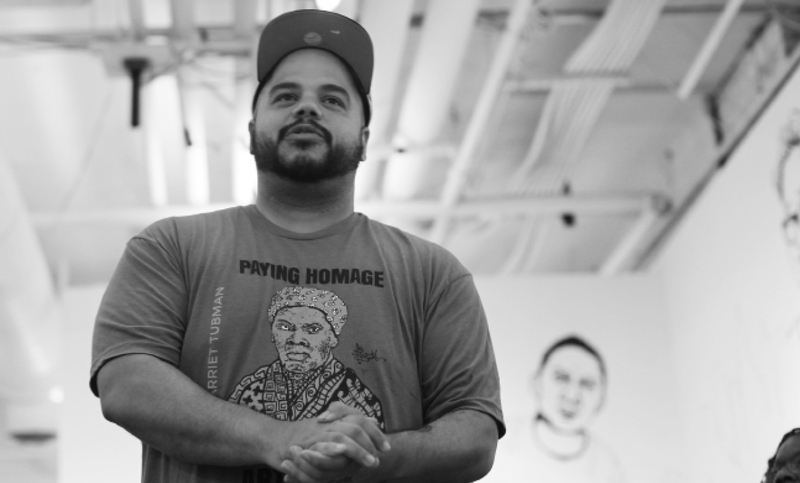 But his pieces typically portray hip-hop artists like Kendrick Lamar, civil rights leaders like Lillie Mae Carroll Jackson, and victims of gun violence like Freddie Gray. By painting historically marginalized icons onto the pottery, Lugo says he reclaims the material. Recently, he’s been returning home to Kensington with a generator and pottery wheel. By crafting ceramics in the streets, Lugo hopes to invite pedestrians to experiment with the sometimes-alienating art form. India Wolterstorff’s piece paid tribute to Estelle Griswold, who gained notoriety for the Griswold v. Connecticut case brought before The Supreme Court, which set the stage for reproductive rights by legalizing contraception for married couples in Connecticut. Griswold was the former head of Planned Parenthood’s New Haven branch, where Wolterstorff herself teaches other teens about sexual health. “It was really important to me to do someone who is local to New Haven,” Wolterstorff said. But none was so lucky as apprentice Jaida Stancil, whose subject came to the opening celebration. Stancil honored her grandmother, a construction worker in Connecticut, for her strength in choosing a field that employs few Black women. “Yeah, she’s going to cry,” Stancil said, nervously checking her phone as she awaited her grandma’s arrival. Helen Kauder, director of Artspace, said the program directors have begun to opt for emerging artists rather than veterans as instructors; the first summer of SAP, renowned conceptual artist Sol Lewitt, 73-years-old and at the peak of his artistic career, led the program. They’ve also focused on recruiting artists who resemble the majority-Black and Latinx students at SAP. “What I found really refreshing working with these students was that we were able to find intersections and support one another. It created this space where we understood each others’ plight and we could celebrate in one another’s differences,” Lugo reflected after his own performance. Compared to Sol Lewitt, whose wall drawings involve carefully calculated instructions to be executed with incredible precision, Lugo is less scrupulous. “I’m sort of a perfectionist, and Roberto helped me let go a little bit because clay doesn’t always turn out how you first want it to when it gets fired,” Wolterstorff said. The commercial art world doesn’t always encourage messiness. Critics prefer stark white walls to the urban lot. Messy is the antithesis of Josef Albers: it’s the borders of the students’ murals crafted from scrap clay into intricate design. It’s the scene of nineteen teenagers frantically installing their work the day before the opening, doodling on empty space of the gallery walls. To Lugo and his students, it’s a source of pride. – Addee Kim is a sophomore in Jonathan Edwards College and Sarah Pillard is a sophomore in Silliman College.